There are many things I want to try in the kitchen, and yeast bread making is definitely one of them. I decided to take the leap and try these Brioche burger buns I've had on my list to try for a few months. I always get annoyed that when I want burgers, Sloppy Joes, or household favorite Spicy Chicken Sandwiches, I have to plan 3-4 bun-friendly meals, which rarely equates to figure-friendly. The reason for planning that way is that I hate to buy a package of hamburger buns just to use only half of it! I know people say you can freeze store-bought bread products, but come on... they're nasty thawed out. That being said, I do believe that heartier bread products, and those made without nasty chemicals do freeze and thaw well, which is why I finally broke down and tried my hand a burger buns, so I could freeze the leftovers to use later. The buns were actually easier to make than I expected and tasted every bit as good as I'd hoped. The only thing I'll change in the future is to make more buns in smaller sizes. I don't know if my dough rose too much, or if I just like smaller buns, but I think the amount of dough I had would have easily made 10-12 decent size buns. If you like yours bigger, by all means divide into 8 equal sections as the recipe calls. In the bowl of a stand mixer fitted with the paddle attachment, combine the milk, water, yeast, sugar, salt and egg. Mix briefly to combine. Add the flours to the bowl, and mix until incorporated. Mix in the butter. Switch to the dough hood and knead on low speed for about 6-8 minutes. The dough will be somewhat tacky, but you want to avoid adding too much extra flour which will create tough buns. Line a baking sheet with parchment paper or a silicone baking mat. Using a dough scraper, divide the dough into 8 equal parts. Gently roll each portion of the dough into a ball and place on the baking sheet, 2-3 inches apart. Cover loosely with lightly oiled plastic wrap and let rise again, 1-2 hour, until puffed up and nearly doubled. Set a large metal pan of water on the lowest rack of the oven. Preheat the oven to 400 degrees F with a rach in the center. 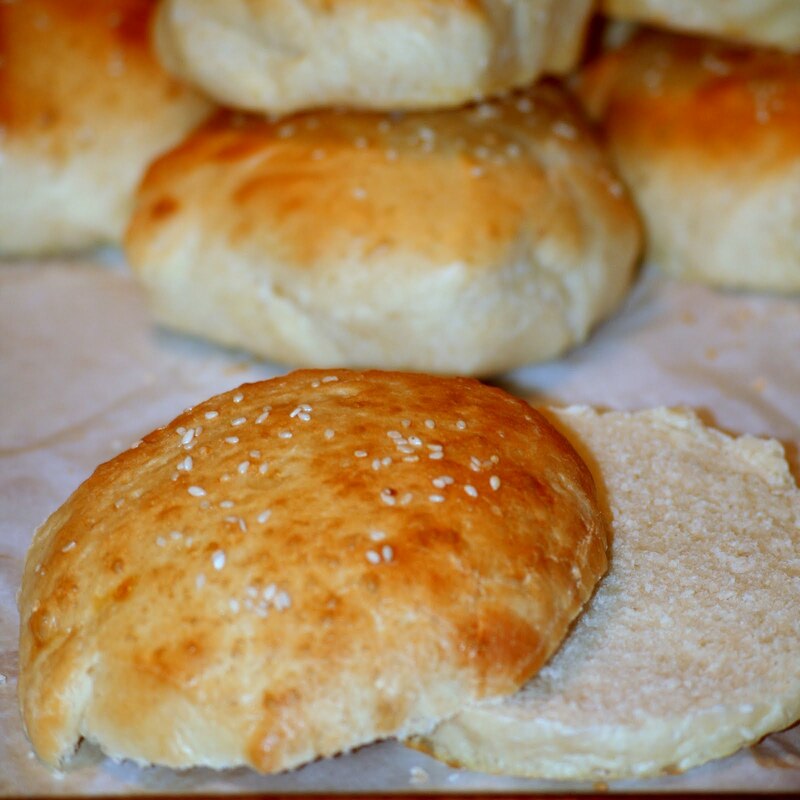 Brush the tops of the buns lightly with the egg wash and sprinkle with the sesame seeds. Bake the buns about 15 minutes, rotating halfway through baking, until the tops are golden brown. Transfer to a rack to cool completely. Those look great, good job!